Jetport Airport Parking provides long term and short term parking at Tullamarine Airport. The company has a 30-year history and 3000-space facilities at Melbourne. So you’ll have peace of mind leaving your car parked outdoors with them. There’s 24-hour security with CCTV monitoring and a reception that’s serviced at all times, so your vehicle will be safe and secure. A 24-hour shuttle bus service takes you to and from the airport in just five minutes. Professional valet attendants will park your car for you. Just leave your keys at reception after dropping it near the entrance and chill out with a fresh coffee. Corporate travellers can catch up with emails in a business lounge with free wi-fi and there’s also an onsite bodywork service. 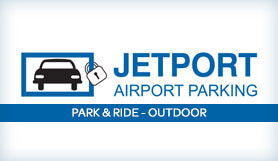 Jetport Airport Parking offers a high standard of service which all types of customers will appreciate. Jetport is an official partner of Melbourne City F.C. Full range of valets available to book on arrival. Jetport's bus service runs on demand and as such we are unable to provide child seats. We recommend that you drop your partner with your children off at the terminals first and then park your car with us. For further information on this please call our office. This is a convenient valet service, meaning your car is parked for you and you will leave your keys with reception. All you have to do is park up in the drop off area outside reception, where the friendly, well trained, uniformed and polite staff will be waiting to greet you. We suggest you allow at least 10 to 15 mins to arrive at Jetport before you wish to arrive at your terminal. We recommend you plan your trip before leaving for Melbourne Airport e.g Is there traffic today, do I have a map, will there be road closures? Full instructions will be given on arrival to the car park. From the city, take the Tullamarine Fwy and exit at Mickleham Rd. Turn left onto Mickleham Rd and take the first right turn into Garden Drive We are located at the end of the street.